Long Lake Living: Keep those pictures coming: Only 14 days left! Joe is from Aurora IL. 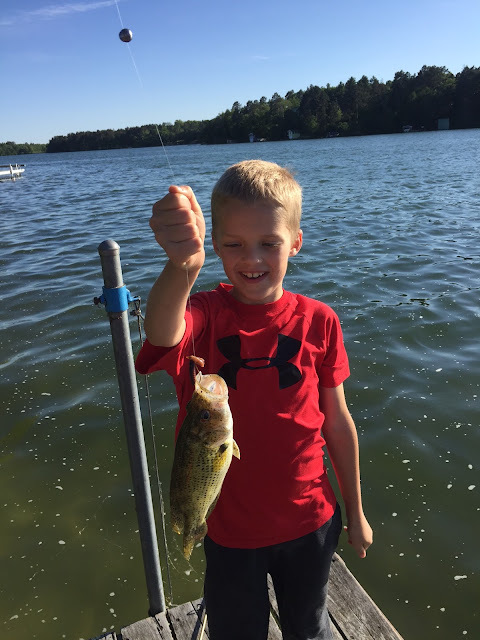 Seven year old, Joe, was fishing with his dad and little brother, John, when he caught this fish. He used a worm for bait. Joe caught the fish right from their dock on the east side of the lake - Breezy Pines Drive. He caught it on June 6th at 7:30pm. Joe loves to spend time at the cabin fishing from the dock with his dad. Spending time with dad fishing is the best way to spend a summer! !